Protecting newly-planted trees – especially evergreens – in their first winter is a real issue for gardeners who live in cold parts of the country. Every fall and winter it comes up and everyone wants to know the best way to do it. Strangely, that ‘best way’ has been available for many, many years now, but it remains unknown to most gardeners, but widely used by professionals. It uses a simple product, but one rarely promoted, and so unknown to most people who at this time of year are out struggling with burlap, plywood sheeting, string, and all sorts of methods – most of which don’t work half as well, and involve much more work than this simple but very effective one. What is this ‘magic’ product? Anti-desiccant spray. That’s right, you have probably never heard of it, and perhaps you imagine it sounds like a skin or hair care product . . .
Anti-desiccant sprays are 100% natural, organic, green, or whatever you call something made from nature, with no modifications. They form an almost invisible protective coating over the foliage that dramatically reduces water-loss from the foliage. As a result, the leaves of your evergreens – arborvitae, spruce, cedar, holly, boxwood, rhododendron, etc. – remains green all winter. This truly is the miracle product garden product that no-one knows about. Why Do Evergreens Turn Brown in Winter? Perhaps the reason anti-desiccant sprays are not widely used by home gardeners is because they misunderstand the causes of winter injury. Very reasonably, most gardeners think the cause is low temperatures. After all, in warmer areas plants pass through winter unscathed. The truth is, though, that cold is only an indirect cause of the problem, while the real cause lies in the effect of drying winds and the relationship between roots and leaves. Although many evergreens have tough, leathery leaves, or small leaves that cling to the stems, as well as thick, waxy coating on the leaves, they do still lose moisture from them in winter. This happens slowly all the time, but when cold, dry winter winds blow it happens a lot quicker. That water must be replaced with water drawn up from the ground, or the leaves will dry and die. With large leafed plants like Rhododendron you can see this, because you see the tips of the leaves dying first, since they are the furthest part away from the source of water – the stem and roots. In turn, that water must come from the roots, and this is where the problem starts. Newly-planted trees have small roots systems, so they find it hard to draw up enough water for the leaves to stay moist when those dry winds blow. As well, when the ground freezes, so does the water in it, and the roots can’t get water from an ice cube! New plants have shallow roots, so they aren’t connected to the deeper, unfrozen soil to get water from there. The end result is no water in the leaves, and so dryness and winter injury occur. Most traditional ways of preventing this injury involve improving water availability by watering thoroughly in fall, and mulching to keep the ground from freezing, but this often has limited success, especially with newly-planted evergreens. Anti-desiccants tackle the problem at the other end, by preventing water loss from the foliage, and this is a much more very effective approach. They are also useful if you are trying to grow plants like roses, rhododendrons and hydrangeas in the north, at the limits of their hardiness. Spraying on the flower buds of rhododendrons help them survive the winter, and on the stems of climbing roses and on hydrangeas they help keep the buds and stems alive, so that you get more flowers the next year. They are also useful in summer when planting trees and shrubs, to keep them healthy while they root, and stop the foliage from wilting and dying. 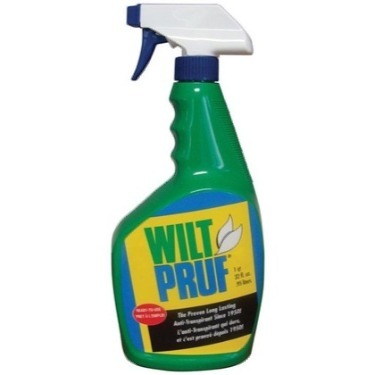 There are different brands of anti-desiccant sprays, with names like ArborGuard, Wilt-Pruf, and Wilt-Stop They all contain the same ingredient, called pinene, a natural chemical extracted from pine trees. When mixed with water pinene forms a natural polymer. In other words, the molecules join together into a giant network that creates a coating like a natural plastic covering for the leaves of your plants. The coating dramatically reduces the rate at which water is lost from the leaves, so it reduces and usually prevents all winter-burn and desiccation injury in plants. You can buy anti-desiccants in several forms. Some come pre-mixed – just enough for one or two plants. If you have more, or a hedge to treat, look for a concentrated form containing at least 25% pinene. It is easy to apply. Dilute it with water according to the directions. Use a garden sprayer to spray it on the leaves thoroughly, until it drips off a little. Don’t skimp, as its success depends on a solid covering. At first your plants will look bluish-white, but once it has dried completely it is transparent, and just leaves a slight sheen. – Read the label and choose the correct dilution rate for the time of year, and your purpose. 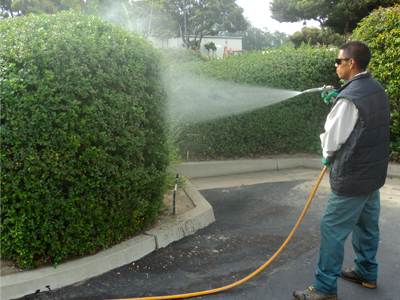 – Spray when temperatures are around 40-50 degrees F, and certainly when it is above freezing. The leaves should ideally be dry, and the spray needs time to dry afterward, so don’t spray when rain is expected within a few hours. – Wait until December to spray your evergreens, or late November in zone 4 or colder. Plants should be dormant, or the spray will trap too much water in the leaves. This may then freeze, rupturing the cells of the leaf, and they will turn brown. Dormant leaves contain less water, so this can’t happen to them. – Spray thoroughly, from top to bottom, and also spray the underside of the leaves. Plants lose water from both sides of the leaves, so you need to seal the whole plant. – The coating gradually wears off, especially if there is a lot of rain, so in periods when the temperature is above freezing, it helps to apply another coat – as often as once a month if you can. – Blue spruce are very hardy, and rarely suffer winter-burn. Don’t be tempted to spray them, as they have their own natural coating, which also gives them their blue color. Spraying will damage that coating and make them unsightly.